Caskets, Boxes, Goblets, Wine Glasses, Beer & Ale Glasses, Flasks, Tankards, Shot Glasses, Absinthe Glasses, Absinthe Spoons, Mugs, Flags, Calendars, Playing Cards, Tarot Cards, Imitation Roses, Jewellery Stands, Candlesticks, Candle & Tea Light Holders, Gear Knobs, Resin Skulls, Hand Mirrors, Wall Mirrors, Table Mirrors, etc. Alchemy's alternative lifestyle giftware is as varied a range of treasures and inspired designs as anywhere, but all with a distinctive touch of design class and creativity that is unrivalled. The Vault, resin giftware items, are designed and developed in England by the Alchemy Studios creative art and design team, and then made for us by our manufacturing partners abroad. 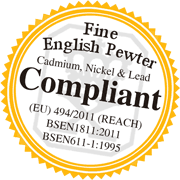 All metal items and decorative metal components are made from fine English Pewter in Alchemy’s own workshops in Leicester, England. Printed products are produced by various Alchemy Licensed partners. Other materials used in Alchemy's premium in-house crafted products, particularly drinking glasses, include forest glass, each bowl being individually hand blown in craft studios in the Czech Republic.